What are the minimum system requirements for viewing MyFedTrainer.com courses? 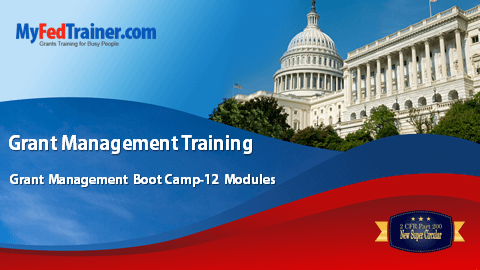 Grants Management “Boot Camp” is a series of 12 online lessons where you get comprehensive presentations, professional narrations, and training notes. Each lesson take about 50 minutes to cover core learning objectives, reinforce key concepts and wrap up with a brief assessment to ensure understanding. For those who prefer visual learning in addition to audio learning, the complete narration can be viewed through the “notes view” as you progress through the courses. And you’ll have a full year to complete the courses.